It is common for equine veterinarians to work a five to six day week with additional “on call” emergency hours as needed. Work may occur outdoors in varying temperatures and weather conditions. Veterinarians, especially those working with large animals, should always follow proper safety precautions to minimize the risk of injury while working with their patients. According to statistics from the American Veterinary Medical Association (AVMA), more than 75% of vets work in private practice. Equine veterinarians in private practice may either work from their vehicle (making farm visits) or in an equine veterinary clinic. Many equine vets offer a combination of both clinic-based and mobile services. 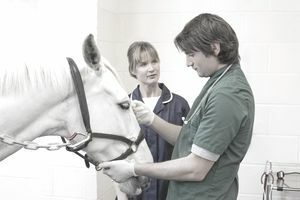 It is not uncommon for equine veterinarians to have a large animal mixed practice, which includes other livestock species such as cattle, sheep, or goats. Others choose to offer a mixed practice serving both small and large animal patients. According to the AVMA, only 5.7% of all veterinarians are equine vets or roughly 4,000 in the U.S. There are an additional 4,220 vets involved in mixed practice as of 2017. Nearly half of equine veterinarians are involved with performance horses while other major areas of service include pleasure or farm work, racing work, and reproductive work. Upon graduation, vets must also successfully complete the North American Veterinary Licensing Exam (NAVLE). At the end of 2017, the most recent AVMA employment survey available, there were 117,735 practicing U.S. veterinarians. The American Association of Equine Practitioners (AAEP) boasts 10,000 member veterinarians from 67 countries, making it the world’s largest equine veterinary organization. The AAEP puts on a major convention each year with over 100 hours of lectures and demonstrations available to equine veterinarians. The median wage for veterinarians is around $90,000 according to the most recent Bureau of Labor Statistics survey conducted in 2017. The average professional income for equine veterinarians is $64,000 per year according to payscale.com. Veterinarians who are board certified in a particular specialty area such as ophthalmology, oncology, or surgery generally earn significantly higher salaries as a result of their advanced education and experience. According to data from the Bureau of Labor Statistics, the veterinary profession will expand at a faster rate than average—about 19% from 2016 to 2026. The limited number of graduates from vet programs will translate to excellent job prospects in the field. With over nine million horses in the United States alone, demand for equine medical services should continue to increase at a healthy rate for the foreseeable future. Demand for equine specialists should continue to grow.